Bralettes, in plus size, too! 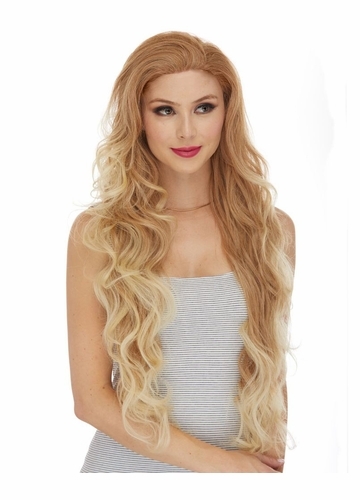 Ultra long wavy wig with side swept long layers framing the face. Realistic skin part on the side. Large glamour curls in silky, touchable synthetic fibers cascade down all the way to 28"-30" length. Premium quality adult size wig. Styling and heat friendly Futura fibers, tolerates curling iron and heat styling. Model is wearing this wig in ombre blonde&auburn crown/auburn&brown tips. Color blends showcased in this style are truly beautiful. Email Sign Up //Get great deals, news & more! I was very pleased with my purchase and the expediency of receiving my order. I plan to order again with My Diva's Closet and I thank you for your service. Great prices, fast delivery, and excellent product. Will definitely buy from My Diva's Closet again. They have the best flip-flop selection! Super fast service, item was shipped the day I placed the order and arrived exactly when it was scheduled to. Price was excellent. Will definitely shop here again! © Copyright My Diva's Closet - All Rights Reserved. Visit our friends at Foxy Wigs.